What Day Of The Week Was January 14? 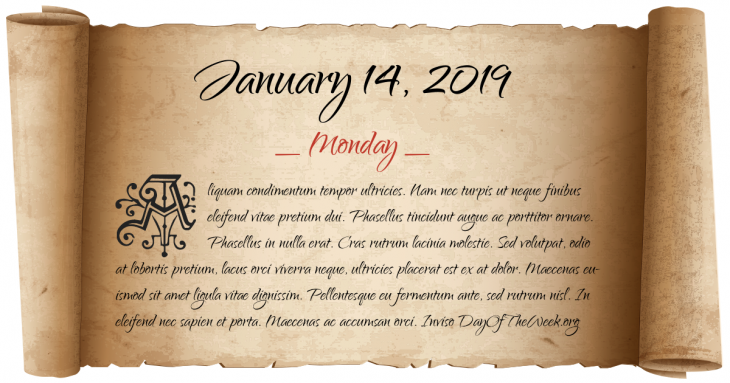 January 14, 2019 was the 14th day of the year 2019 in the Gregorian calendar. There were 351 days remaining until the end of the year. The day of the week was Monday. It is celebrated as New Year’s Day (at least in the 20th and 21st centuries) by countries still following the Julian calendar. World War II: Operation Ke, the successful Japanese operation to evacuate their forces from Guadalcanal during the Guadalcanal campaign, begins. Counterculture of the 1960s: The Human Be-In, takes place in San Francisco’s Golden Gate Park, launching the Summer of Love. An Afghan cargo plane crashes into a mountain in southwest Pakistan killing more than 50 people. Stampede near Sabarimala – 104 devotees killed and several others injured in a stampede at Uppupara in Idukki district. Who were born on January 14?